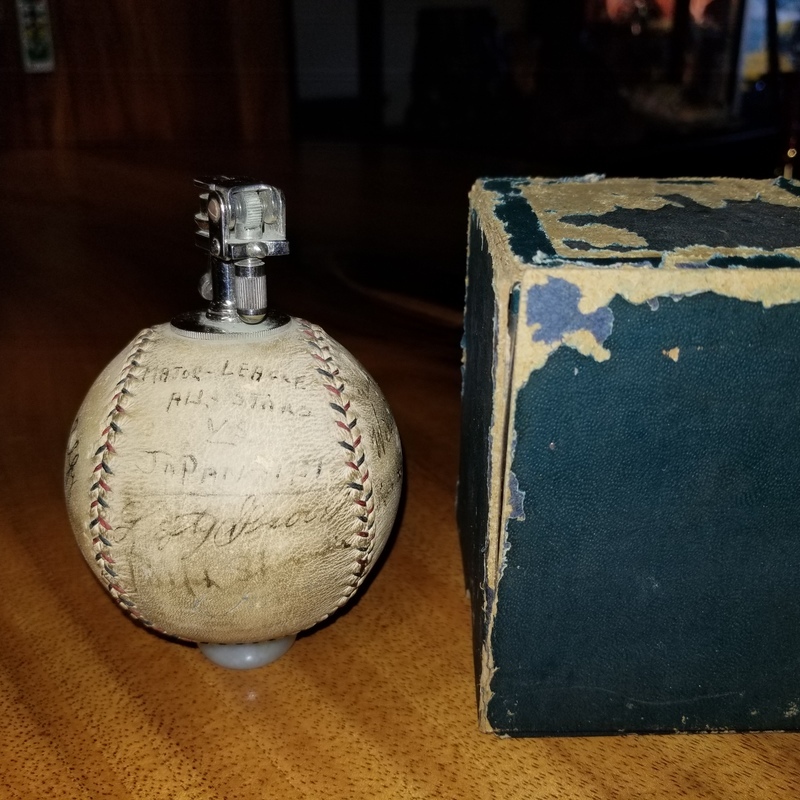 Aloha, I recently acquired this 1931 Major League All Stars vs Japan Team Signed Baseball Lighter with Original Box, from Other than the box there's no other paperwork, it was purchased from the Lahaina Historical Society when they sold off the Estate of Frances Hinton. From my research it appears that only the players personally received these lighter balls. Feel free to let me know if you need more pics or info? This ball was purchased from the Fances Hinton Estate at 399 Front street in Lahaina. The Hintons were a very well known family in Lahaina, they were the original founders of The Lahaina Yacht Club and help fund quite a few restorations on Island. Thank you for submitting your item for appraisal. This appears to be a japanese manufactured baseball used during the 1931 United States All-Stars Tour, with the signatures of Lou Gehrig, George Kelly and others. Very few similar have been offered in the past years. In general the market for sports memorabilia has suffered a few blows recently due to authentication problems. I don´t see a problem with the baseball lighter in your possession. Another lighter from the 1934 Tour with a perfect pedigree and provenance even sold for 35.000 plus premium. You will have to get the lighter authenticated by one of the leading accepted authentication agency. Mahalo's for the info Klaus, can you recommend an agency to authenticate the ball? Thanks again for the quick response, I'm looking forward to you guys evaluating many more of my one of a kind artifacts i've collected over the 10 years of picking. Honestly, I can´t recommend any authenticator. There are two widely accepted which appear again and again mentioned in connection with high priced sports memorabilia.